The Consumer Electronics Show (CES), which ran January 7-10 in Las Vegas, is not the place to see the latest pro gear, but it is a good place to see the general direction of the electronics entertainment industry. Just a couple of years ago 3D was the rage, with manufacturers showing off their 3D displays and headsets. By all reports, 3D wasn’t so hot this year. Instead, we saw the first salvos in the 4K battle to convince consumers to part with their money for another high-end display. But when it comes to televisions, 2013 may be seen as the bridge to 4K, rather than the year of 4K. Sony, Sharp, Panasonic and even Westinghouse were showing 4K displays, but all are expensive, and some of the shipping dates are elastic. And there’s still very little 4K content available, meaning that once you part with your money, you’re mostly going to be watching upscaled Blu-ray content. Sharp was showing a 31.5 4K display that will sell at around $5,500, but at that size, you’re only going to notice the resolution if you’re standing next to the display, making this more suitable for special end-user applications than for use in the living room. All the other, larger displays were much more expensive. Companies are continuing to explore ways to share and play content on devices in the home. Netflix had a number of new advances, including the ability for family members to create their own profiles and maintain their own queues. Also coming is 1080p – they call it SuperHD – and 3D streaming, although this will be available only on some ISPs. Netflix also previewed 4K streaming and were talking up the DIAL multiscreen initiative with YouTube that would coordinate streaming to mobile devices and compatible TVs. 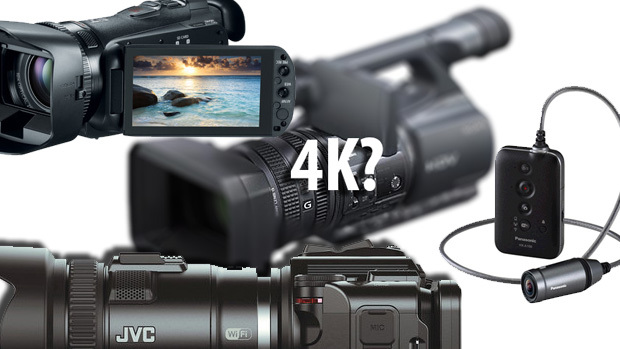 Several companies took the annual chance to update their consumer video camera offerings. Most of these involved minor tweaks to existing models. Interestingly, Sony has now added mini projectors to all of their high-end (around $1,000) consumer cameras. These projectors aren’t very bright – they aren’t going to replace your home TV – but they may be a useful way to create an impromptu preview of your content. In a dark room. Panasonic showed a neat little Action Camera variation that separates the lens from the body. This is not really a new idea; Sony’s been selling something like this – the HXR-MC1 – for three or four years, but that camera costs almost $2,000. 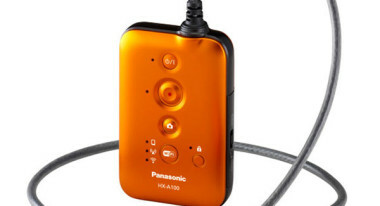 The Panasonic HX-A100 wearable camera will cost $300. Canon updated their high-end consumer video camera, the HF G10, with the HF G20 ($1,100). The upgrade offers a new sensor with improved low-light performance, less noise, a modified lens hood, and a price that is a couple of hundred dollars lower than it’s predecessor. No major changes, but as a small-chip camera, the HF G10 was already a really nice small camera. Meanwhile JVC showed the GC-PX100, their new high-end consumer camera that will record at 36Mbps and supports frame rates between 120 and 600 fps. We believe this is at 1920 x 1080, but haven’t seen any footage to confirm this. It is a fixed lens, small sensor camera that will retail for $1,000, which for those who want to shoot some high-speed footage is significantly cheaper than the Sony NEX-FS700, never mind the cost of a Phantom. Sony also previewed a 4K handicam, though the camera was under glass and few details were offered. They also warned that the final camera might not be exactly as represented. In its current incarnation its body is very similar to the HDR-FX1000 HDV camera that Sony has been selling since 2008. The FX1000 is a fixed lens camera that has 3 x 1/3” sensors. If this camera were produced it will probably also have a fixed lens, and a small-sized sensor. But it’s also probable that it will sell for less than $5,000, and if that’s the case and Sony follows the development pattern they followed with HDV, then within a year or two a similar sensor will appear in even cheaper cameras. 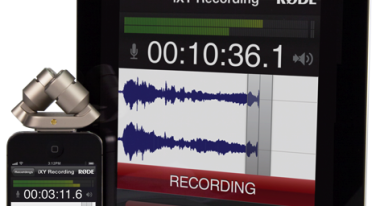 RODE announced an add-on mic for the iPhone/iPad, the iXY. It promises stereo 24-bit/96 kHz recording, and will sell for $199. While I’m not sure I’d want to dedicate my phone to use as the primary audio recorder, it could be a good emergency backup, or an excellent way to recycle an iPhone that you’re retiring. But before you rush out and spend that $199, you might consider whether a Tascam DR-40 or Zoom H4n – both selling for under $200 – would be a beater choice. Both offer 24-bit/96kNz recording and they also have XLR inputs, and they are dedicated recording devices. 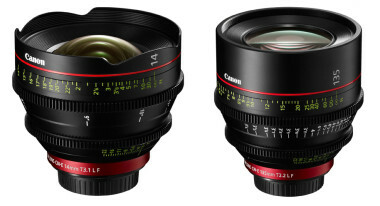 In other news, Canon announced two new cine lenses; the CN-E 14mm T3.1 and 135mm T2.2. These join the existing 24m T1.5, 50mm T1.3, and 85mm T1.3. Canon’s been getting some good press lately with their cine lenses being favorably compared with other lenses in this price range. Surprisingly, Canon still hasn’t released a 35mm cine lens. All Canon Cinema EOS lenses integrate advanced materials and coatings to meet high optical performance levels, including 4K (4096 x 2160) production standards. Each Canon Cinema lens is equipped with an odd-numbered 11-blade aperture diaphragm, which is ideally suited to achieve creative depth-of-field manipulation and pleasing “bokeh” effects of cinematographic quality. While Canon sells their four cine zoom lenses in both EF and PL mount versions, they currently offer their cine prime lenses only with an EF mount. The 14mm is expected in April with an estimated retail price of $5,500, while the 135mm will be available in May with an estimated retail price of $5,200.